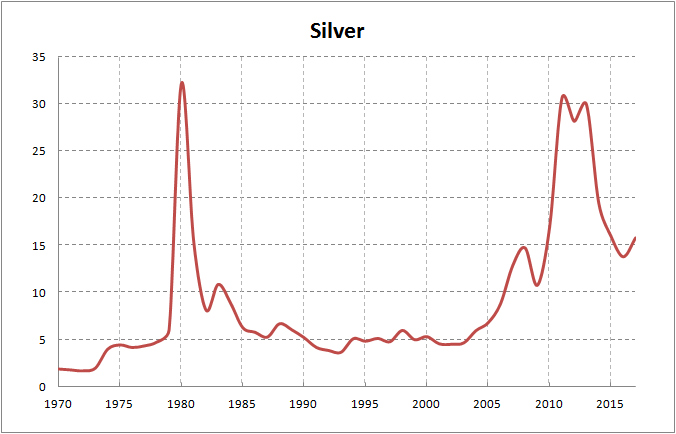 It looks like the silver was heavily overpriced around the year 1980. Then it was loosing the value for another 20 years until its value reached the bottom in the year 2003. Gold as investment looks a little bit better. 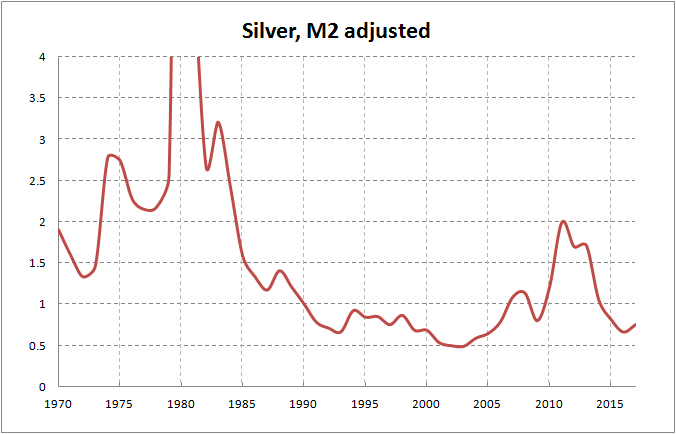 But don’t forget that silver in the year 1971 lost its main purpose which was the material for coinage. 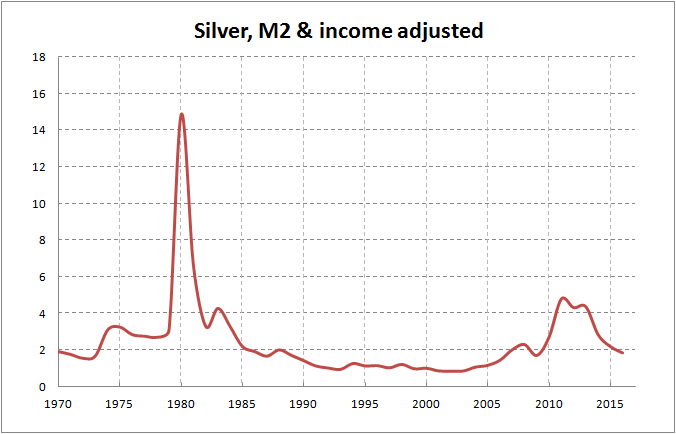 Once the money printing scam ends it will become much more valuable I think. 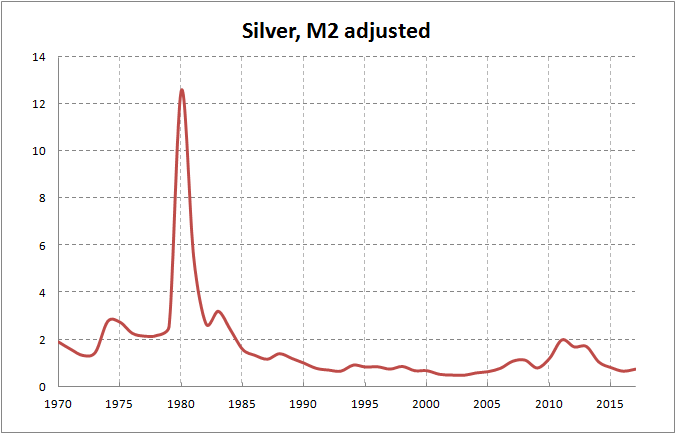 Note: In the year 1980 there was an extreme short term spike in silver price reaching 48 dollars per ounce. It is not visible in the chart, because I use annual data (of the last day of the year). 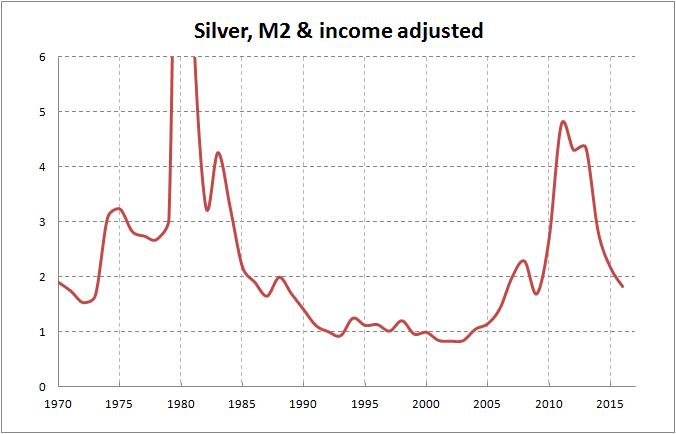 But the long term trend is clear and unaffected. Great goods from you, man. I have understand your stuff previous to and you’re just too fantastic. I really like what you’ve acquired here, really like what you are saying and the way in which you say it. You make it enjoyable and you still care for to keep it sensible. I cant wait to read much more from you. This is actually a terrific site. Hi there! Someone in my Facebook group shared this site with us so I came to take a look. I’m definitely loving the information. I’m bookmarking and will be tweeting this to my followers! Fantastic blog and superb design. Have you ever considered writing an e-book or guest authoring on other blogs? I have a blog based on the same information you discuss and would love to have you share some stories/information. I know my subscribers would enjoy your work. If you’re even remotely interested, feel free to shoot me an e-mail. Wonderful web site. A lot of useful info here. I’m sending it to several pals ans additionally sharing in delicious. And obviously, thanks to your sweat! Great info. Lucky me I came across your website by chance (stumbleupon). I’ve bookmarked it for later! This is a very good tip especially to those fresh to the blogosphere. Brief but very accurate information… Appreciate your sharing this one. A must read post! Howdy! I simply wish to offer you a huge thumbs up for your excellent info you have here on this post. I will be returning to your web site for more soon.